Hosted by Bill and Gloria Gaither and filmed on the magnificent grounds of the Billy Graham Library, this quintessential Tent Revival Homecoming features more than 140 of gospel music's most beloved artists. With sawdust floors, a simple canvas canopy overhead and songs that recapture the spirit of the old-fashioned tent revivals of the 1950s and 1960s, this Homecoming gathering celebrates a time-honoured tradition that has impacted countless lives for eternity. About "Tent Revival Homecoming (Gaither Gospel Series)"
Bill Gaither is the most successful and most honored artist in the history of Christian music. In more than 30 years as a composer, songwriter, and producer he received 3 Grammys, 20 Dove Awards, and the first Gold Record ever awarded to an inspirational album. His "Homecoming Concert" music videos have sold over 7.5 million copies. Gaither was inducted into the Gospel Music Association Hall of Fame in 1982 and was recently honored as Christian Songwriter of the Century by ASCAP. He lives in Alexandria, Indiana. 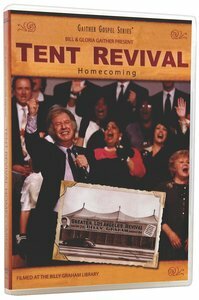 Customer Reviews For "Tent Revival Homecoming (Gaither Gospel Series)"
This DVD was great, i liked how all of the 'Gaither Singers' did a performance infront of an audience, you can see their passion for God. About the third song in i was so teary that the water works just didn't stop the rest of the DVD- very convicting. If you buy this DVD you will see a song sung by two of their oldest members.